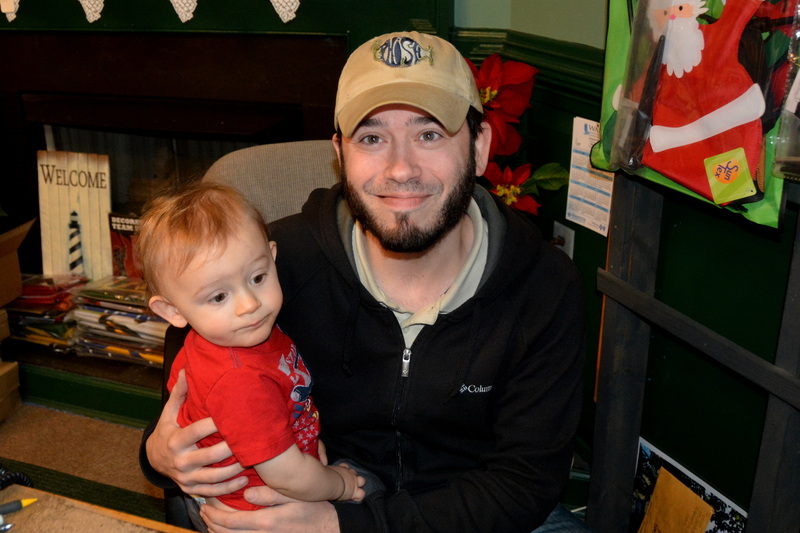 My niece, Gail, and her little boy, Jase, came to visit yesterday. He had a busy day. 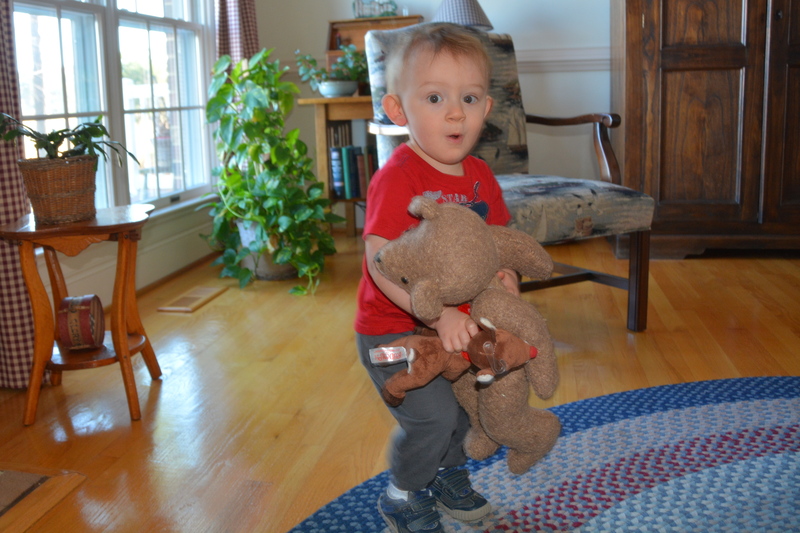 When they arrived, I gave him a new Rudolph stuffed toy, but he also liked an old teddy bear I had sitting in a little chair. He was soon busy trying to carry both of them around the room. 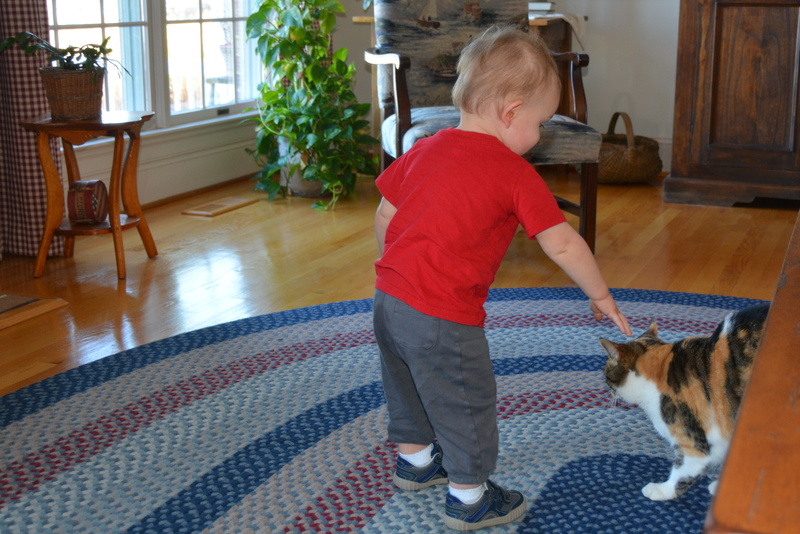 Putting the stuffed animals aside, Jase turned his attention to Sundae as soon as she entered the room. She enjoyed the attention. 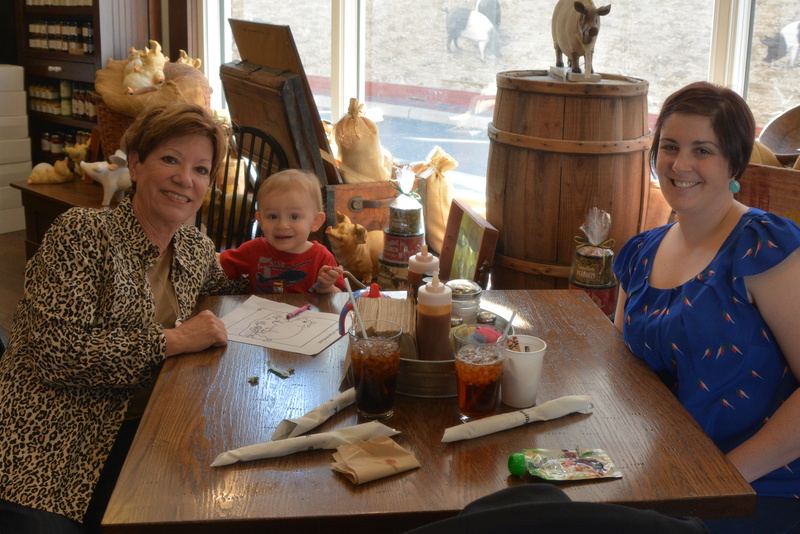 Then Jase had lunch with his mommy and me in town. After lunch, we visited his cousin, Marshall. 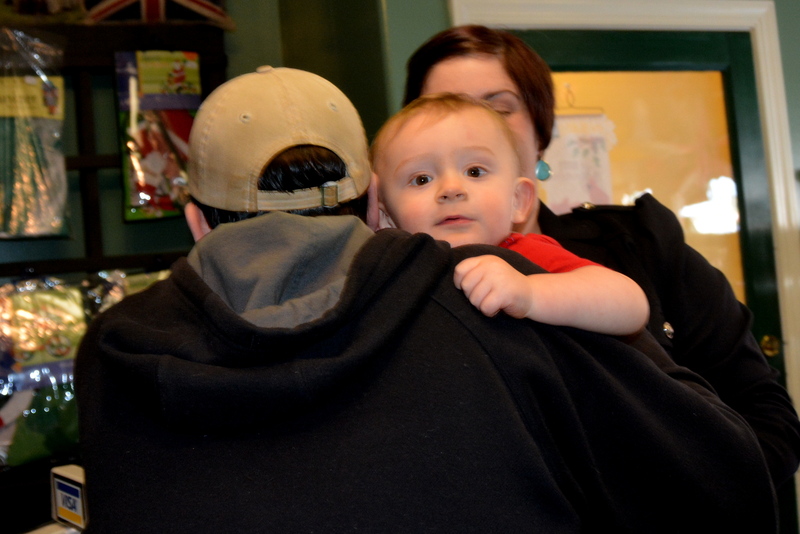 Jase “took to” Marshall immediately, and reached both little arms up to be held. Marshall and Jase are third cousins….or first cousins twice removed. Maybe. Marshall’s grandmother would have been Jase’s great-great grandmother. I just love genealogy. Soon it was time for Jase and his mom to leave to visit other relatives. But, first, a good-bye hug for Marshall. Bye-bye, Jase, you busy little boy! This entry was posted in Days at Home, Family, Sundae and tagged great great nephews birthday. Bookmark the permalink. He is precious. I know you enjoyed your visit. I love your snow on your blog. Will we get any this year? Thanks for sharing a special day. Adorable to see Sundae and Jase together. I bet Jase looks up to Marshall literally and figuratively. This is a sweet sweet post Dianna! Handsome cousins, teddy bears, Sundae and LUNCH! What a cutie! It looks like it was the perfect way to spend the afternoon. What an adorable set of pigtures and handsome little hooman! Precious pictures and memory-making visit. Love spending time with “little people”. He’s so cute. 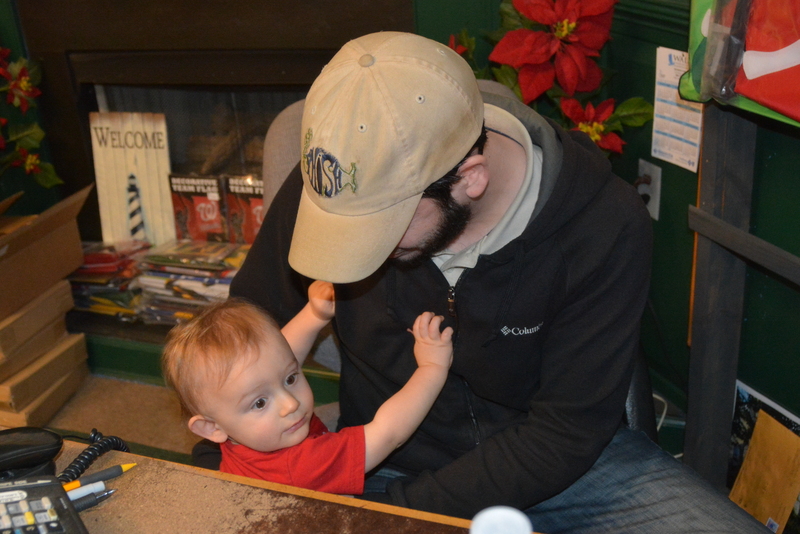 He was all over the place – so much to see in our shop! .. I perched him on my leg, but he didn’t stay for long ! They are busy at that age. We need that energy to keep up with them! Good grief! Twice removed or not he’s a keeper. He and Marshall have similar eyes. Too bad Marshall doesn’t have children of his own. He’d be a great father! Jase is a real charmer! Looks like Sundae and Marshall fell under his spell. What an adorable little guy!!!! Looks like a wonderful time was had by all. What a bundle of joy! He certainly enjoyed himself. Such a cutie. Great! I never understand those cousin relationships, Dianne, once, twice, three times removed. Marshall looks like a sweetheart!